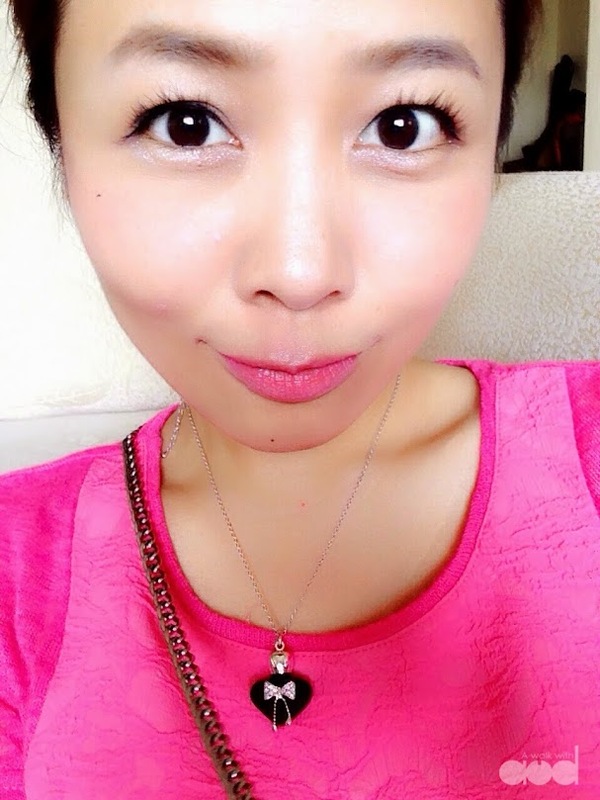 Just curious, have any of you heard of Queen Cat from Taiwan? It doesn't ring a bell until I saw the product and realized that I've actually seen it quite a few times but never knew that it's called Queen Cat. Although sewing industry has been gradually going down the hill in Taiwan, but a bunch of excellent skilled sewing masters gathered to continue the sewing art. They are a group of grannies and moms with cute personalities whom work hard to produce a variety of high-quality bag with their near to extinction skill. 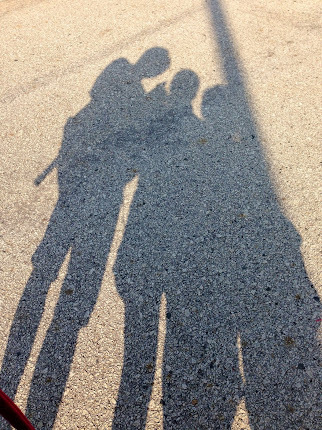 With all the laughters and passion, work is no longer tedious but something they enjoy doing. That is why you can always feel the human touch in QUEEN & CAT products. 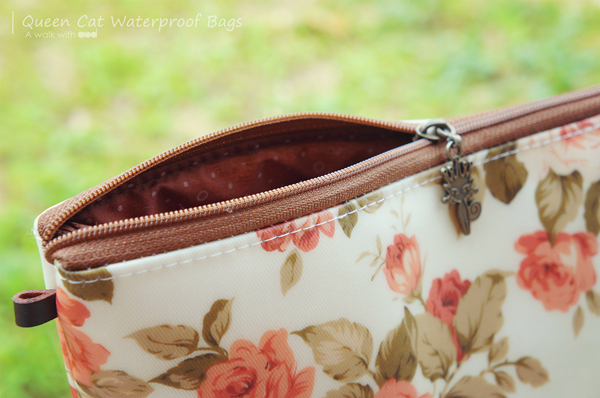 They make sure all the bags are nicely sewn with carefully handled details. 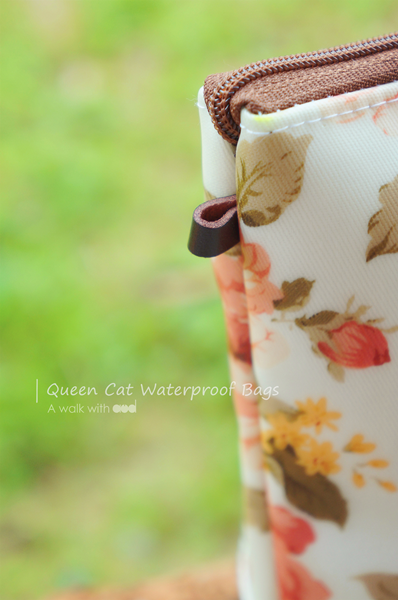 Fanciful yet practical, beautiful yet inexpensive waterproof bags is what you will find in Queen Cat. 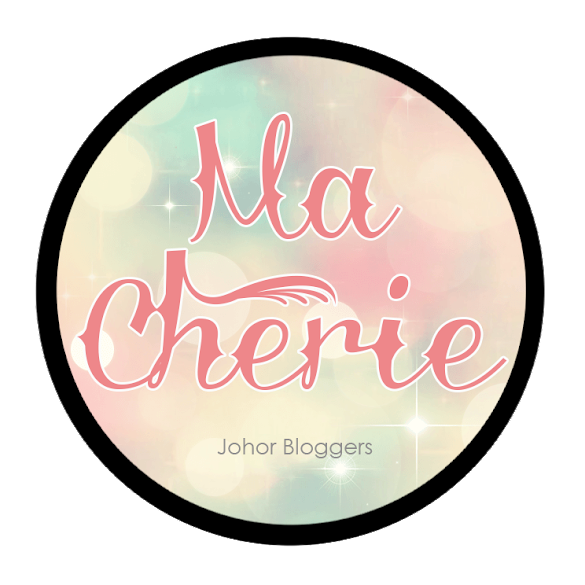 Perfect for Zakka lovers! Now, let's take a look at the details. 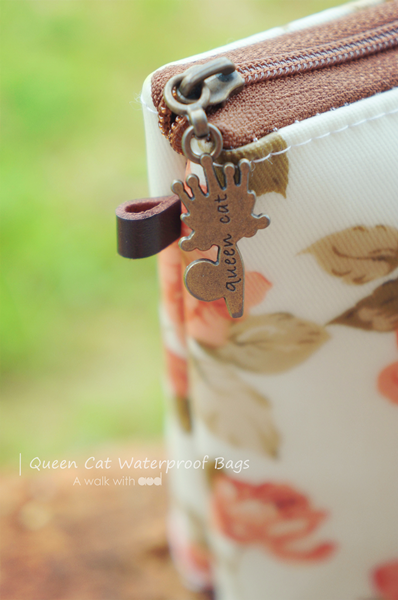 A detailed bronze Queen Cat logo charm attached to the zipper. 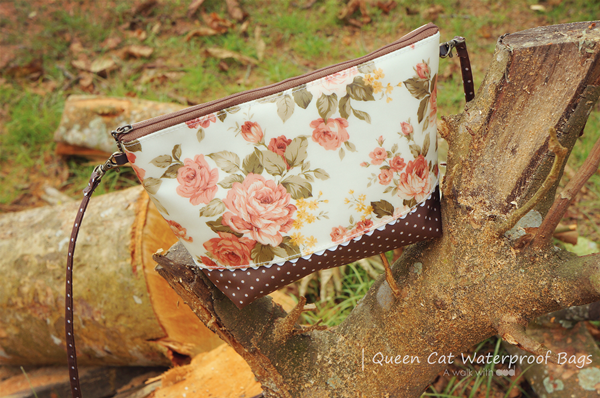 This pouch measures a 25 x 10 x 16 cm. 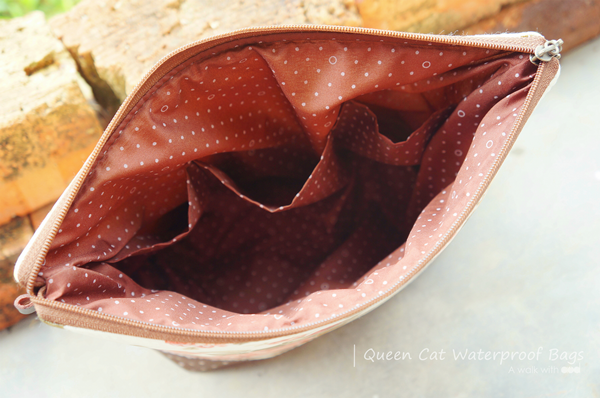 The zip top opens a spacious, lined interior with 3 pockets. 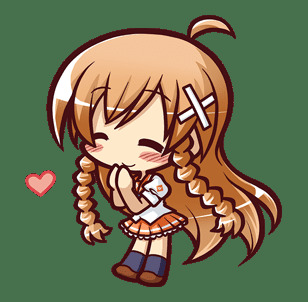 Currently I use it to store all my washis and tapes. There's still space for my coming stationery hauls from Japan! An optional narrow sling strap is included. 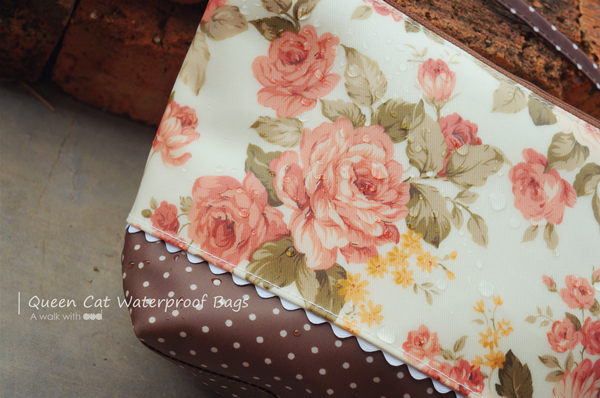 It is made of waterproof fabric too. 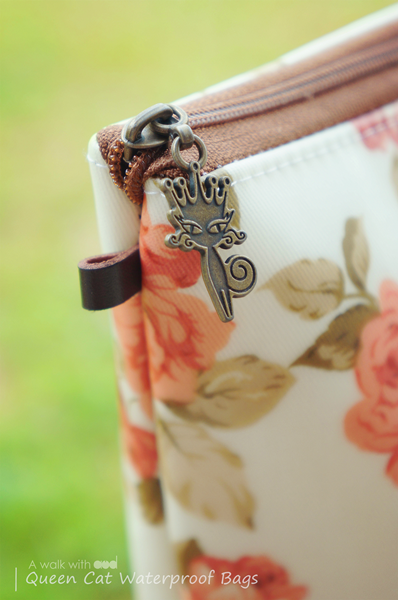 A leather loop on both sides for you to attach the strap perfectly. 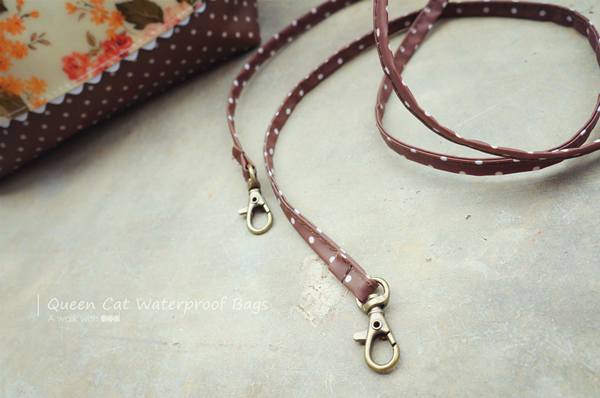 The strap features lobster clasp clip for easy attachment. Note that the lobster clasp is in bronze color? 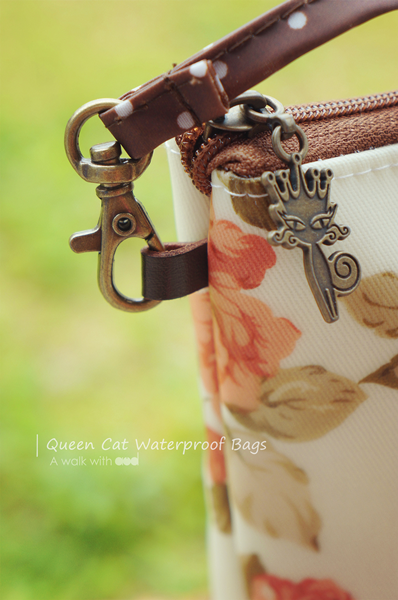 It matched perfectly with Queen Cat charm and the bag color tone. 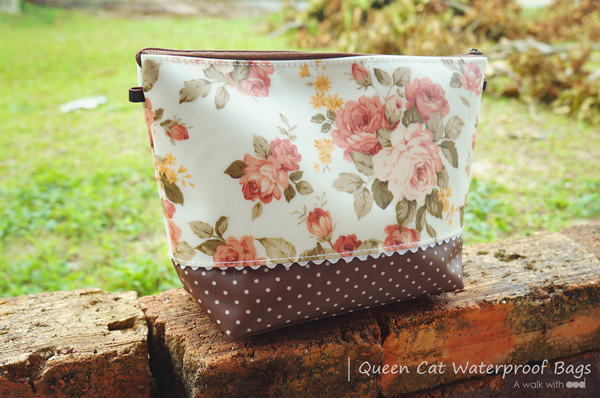 With the additional strap, it can actually double as a sling bag if you do not have too many things to bring. It can fit my purse, iphone 5, xiaomi power bank and some loose makeup items. Just what I needed for an outing. I just love how the whole look is. 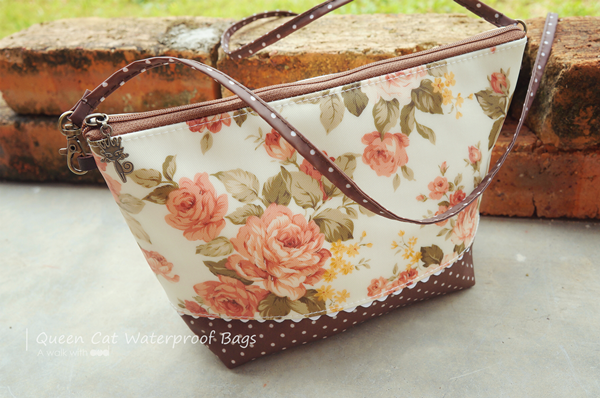 The flora print, the polka dot bottom, the strap, and the cute charm. They just fit perfectly together. 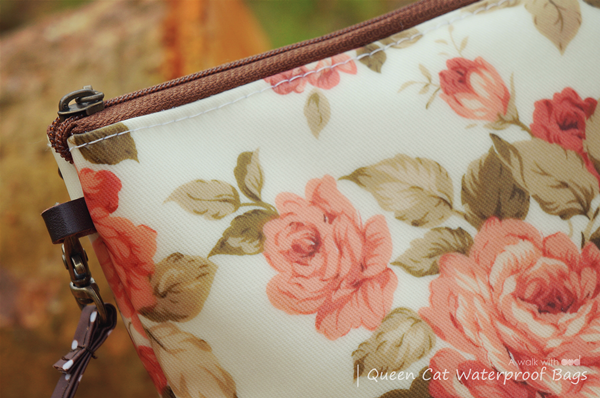 A simple pouch with details. 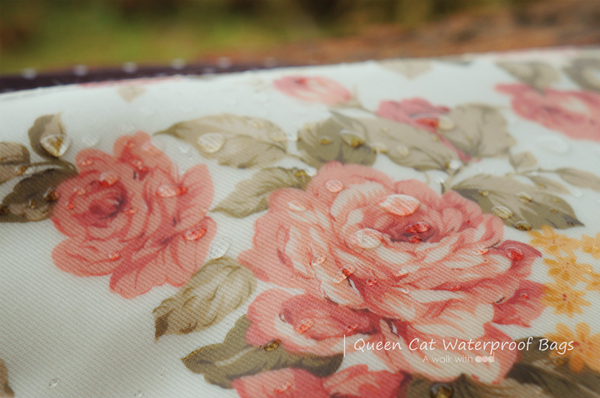 As I mentioned, Queen Cat uses water resistant fabric to make all their bags. 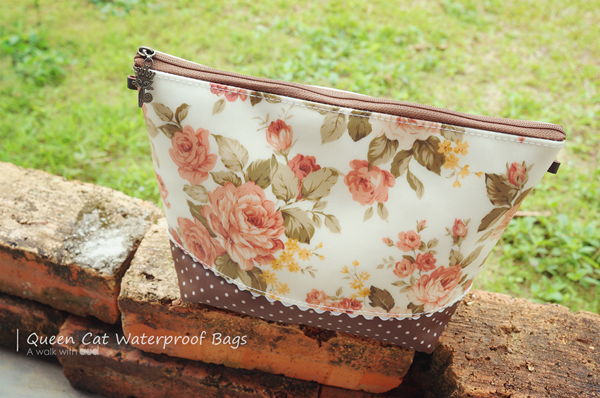 Since it claims to be waterproof bag, let's bring it to a test shall we? I splashed some water on it and leave it for 10 minutes to test it's water resistance level. After 10 minutes, the droplets were still intact. Perfectly waterproof! Here's a close up of the droplets. Now I no longer need to worry about my stuff got soaked/ wet if I ever accidentally drop it into water or got drenched in a heavy rain. 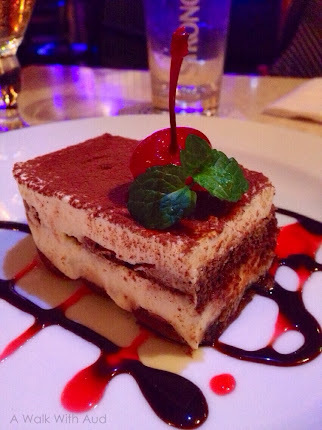 Nice things are meant to be shared. If you feel like getting one for yourself too, now is the time! Just quote MCQC to entitle a 10% discount on any purchase. 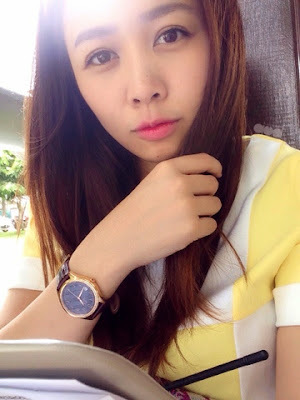 They carries a various range of bags from bigger size tote bags, boston bags, laptop bags, to smaller size pencil case, water bottle case, and even toiletries bag. 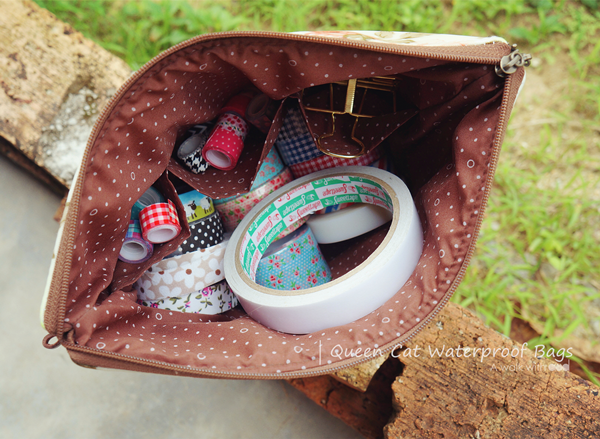 All these bags can be found >>here<<.